The wait is over. Ross hasn't delivered his much anticipated album, God Forgives, I Don't, yet but he compensates with a brand new mixape. 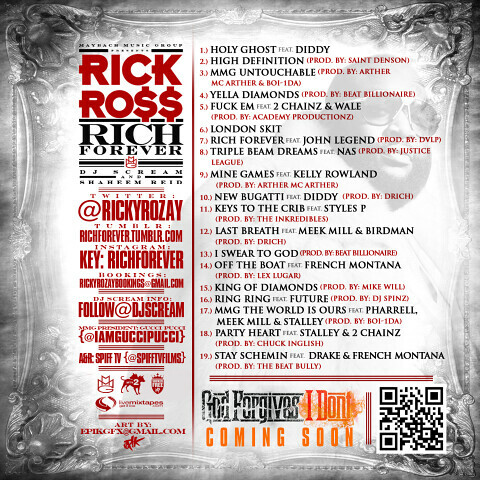 Rich Forever boasts guest features from Drake, Nas, Diddy, Pharrell, Kelly Rowland, John Legend, French Montana, Wale, Meek Mill, Stalley and Birdman. Hosted by DJ Scream and Shaheem Reid. Download: Here| Alternate Link #1 (Hulkshare) | Alternate Link #2 (Mediafire).